The images of sun-flooded Texas were but a distant memory that weekend, as the Circuit of the Americas was instead flooded with relentless downpours, which only allowed for a curtailed practice session on the Friday and one on Saturday, but not as much as qualifying, which was postponed to Sunday morning and then suspended after Q2. But what action was lost in the pre-race sessions, the US GP repaid in abundance in the race itself, which was – for the first time this season – a truly gripping afternoon from lights off to the chequered flag. 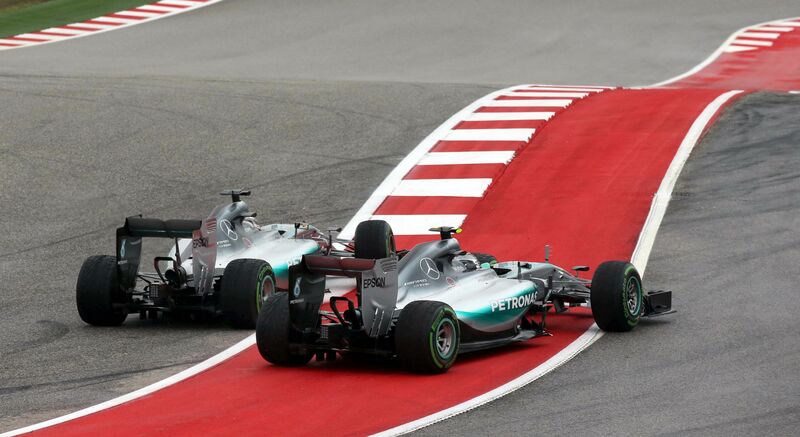 A familiar move by Hamilton gave the Brit an early advantage in Austin. It was a familiar story off the start, with Lewis Hamilton getting the better of his Mercedes team-mate Nico Rosberg starting on pole, and demoting the German a few positions by pushing him off the track on the first turn; but this didn’t develop into a comfortable lead the Brit had got us used to. The otherwise superior Mercedes struggled in the challenging wet conditions which required intermediate tyres – a compound little used throughout the season. To the contrary, the Red Bulls thrived in this scenery, with their chassis benefitting from a better downforce on those compounds. On the first lap Daniil Kvyat jumped his third-placed team-mate Daniel Ricciardo to begin his pursuit of the leader; this had to be put on hold on the next lap due to a collision between Sauber’s Felipe Nasr and his team-mate Marcus Ericsson. A Virtual Safety Car (VSC) was deployed in order for the track staff to clear the debris, which slowed the whole field down. 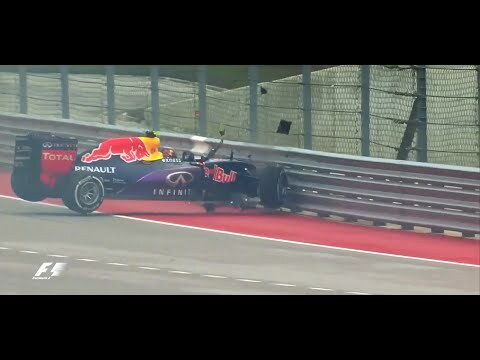 As the track dried out Red Bull lost their winning potential. On the race restart Hamilton slowed the pack to such degree that Rosberg benefitted from the two Red Bulls bunched together to pass them both in a few swift moves. From then on all of the quartet seemed in contention for the lead – and, sure enough, on lap 15 Ricciardo spotted an opportunity and masterfully wiggled his way to the front, while Rosberg followed behind three laps later, demoting Hamilton to third. Although at this stage the German would have had the first pick of changing his grooved tyres to slicks, seeing that the track was now mostly dry, the message to hit the pits had already been sent to Hamilton who didn’t have to be told that twice. His team-mate followed, together with the two Red Bulls who had enough gap between them for both to make the stop on the same lap; the timing of these stops did not promote the championship leader as was expected, and for the time being the lineup on the front remained the same. In the meantime, there had already been a couple of retirements, with Will Stevens packing in his Manor/Marussia on lap one, Valteri Bottas retiring on lap 5 due to a suspension failure; and Romain Grosjean calling it a day on lap 10 with a break issue on his Lotus… and there were more non-finishers soon to come. 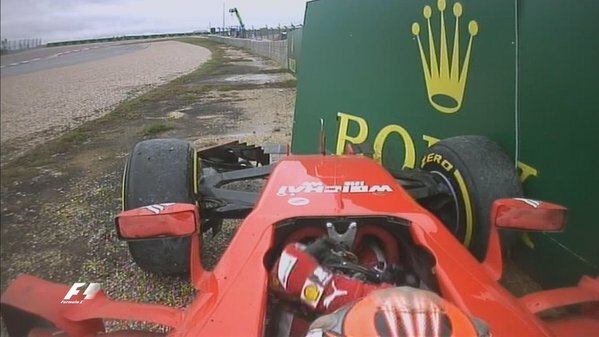 Raikkonen’s 2015 struggles continued, but he wasn’t going to give this GP up without a fight. The change of tyres visibly damaged Red Bulls’ advantage and Rosberg and Hamilton soon moved to first and third respectively; it looked like the field would be levelled out again due to another retirement and safety car period when Kimi Raikkonen – struggling in his Ferrari throughout the whole of the US GP – spun off track and hit the wall on lap 20. The Finn was not going to give up easily, however, and he wiggled the car out of the barrier and rejoined the race. 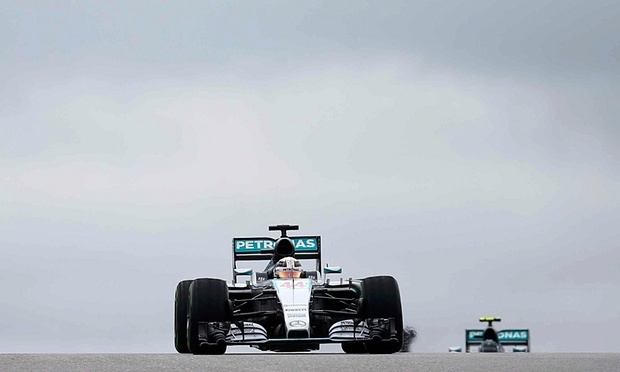 But at the COTA 2015 a safety car – real or virtual – was always but a few laps away, and while Raikkonen retired his car in the pits a few laps later with a break issue, Ericsson found a less convenient spot to park his car and call it a day. An electrical failure forced him to abandon his Sauber at Turn 11, initiating a safety car mode to get it recovered. This wiped our Rosberg’s 10sec advantage over Hamilton, who by that time had moved himself into second; it also gave some drivers an opportunity to make a second change of tyres, but neither of the Mercedes or Red Bulls made the move. In turn, Sebastian Vettel opted for a different strategy, potentially placing himself in the leader’s seat, having by that point moved from a distant 13. start (due to an engine change 10-place grid penalty) into fifth. After this race restart, Rosberg held his position well and gathered momentum over Hamilton, while Vettel gradually caught up to chase for the lead from third – and then on lap 36 Nico Hulkenberg ran his Force India into the back of Ricciardo’s Red Bull, throwing himself out of the race, and launching yet another VSC. 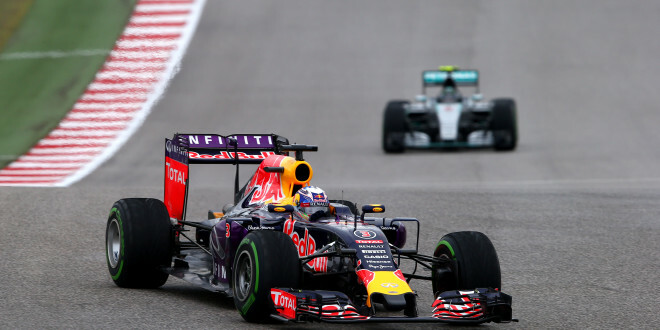 From top to non-finish – the US GP was not the glory story it was panning out to be for Kvyat. This time Rosberg took the opportunity to pit first; but with this VSC being only a lap long, Hamilton missed his window to safely go in for a change of tyres, and risked losing his leader spot once more to Rosberg who was climbing up the grid with incredible speed on his new compounds. It looked like a blotched strategy by Mercedes but that sin was soon forgiven, as yet another accident levelled the grid once more – this time Daniil Kvyat crashed his Red Bull on lap 42 with such impact that called for the real safety car to lead the circus. That’s when Hamilton made his pitstop to reemerge behind Rosberg. On this last race restart the German looked strong to keep the title battle alive at least for one more race – because, if Hamilton had outscored him by only two points, and outscored Vettel by nine, the Brit would be crowned champion. Rosberg was holding his position well, keeping that dream alive… but then ran off track on lap 49, opening the door to Hamilton’s third career title. The pride – or feeling of obligation to his championship-winning team – didn’t allow the German to let his countryman Vettel through on the final laps, which would require Hamilton to earn his title in Mexico; but Rosberg’s second podium spot was no consolation to the second lost title in a row. Rosberg did not even try to be happy for his team-mate’s success, unable to explain the error that cost him the race win. “Obviously that was really, really tough at the time to lose the lead and the win like that. I was feeling really good – it just went wrong. 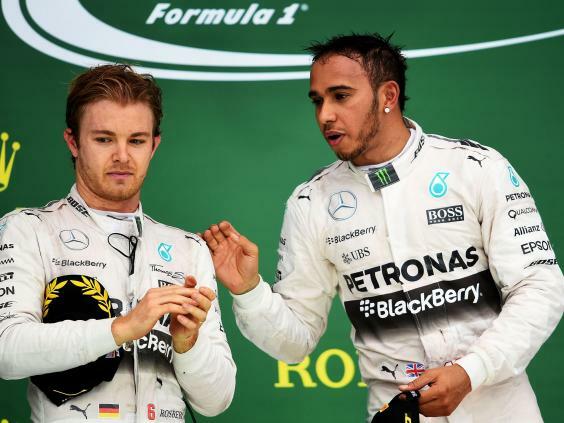 My mistake cost me the win,” Rosberg said after the race. He was the complete opposite of the ecstatic Hamilton on the podium. “I’m buzzing inside… I can’t find the right words to express the feeling but it’s the greatest I’ve had in my life,” the Brit said. And, in fact, he is the only Brit in history of the sport to claim back-to-back titles. The US Grand Prix packed all the F1 elements that we’ve been missing throughout the whole 2015 season: brilliant overtakes, numerous race leaders, crashes and retirements and unpredictable strategies – it even delivered a fastest lap by McLaren Honda at one point, with Jenson Button throwing some fantastic moves on the track to claim 7. finish (his team-mate Fernando Alonso was yet again not as fortunate, and – judging by the team radio – more keen to retire than to continue a losing fight). It was a perfect conclusion to the 2015 title fight, for which, for once this season, the now three-time champion had to work really hard – and, all in all, it was a well deserved win too. 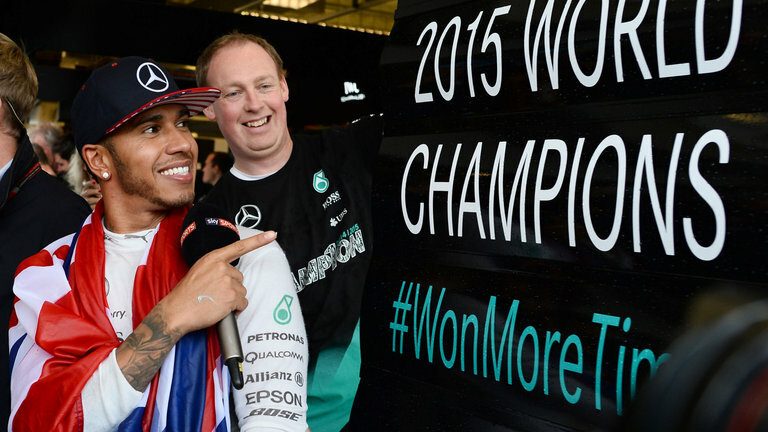 Hamilton’s third career title plants him among the sport’s greatest.